Let's get one thing straight: 2015 was a lousy year for Canadian investors. A stay-at-home 60/40 investor who invested 60% of their funds in a Canadian stock ETF (XIU), 30% in a Canadian bond ETF (XBB), and 10% in a Canadian real return bond ETF (XRB) had a total return (including reinvested dividend and interest payments) of -3% in Canadian dollars. And the Canadian dollar weakened 16% against the US dollar, so in US dollar terms the all Canadian 60/40 Portfolio had a total return of about -19%. The focus of this blog is on generating good returns by taking reasonable risk in easily accessible global (including Canadian) ETFs. 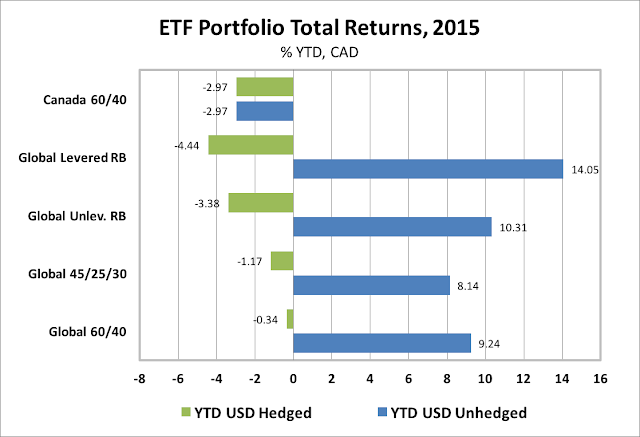 To assist in this endeavour, we track various portfolios made up of a combination of Canadian and global ETFs. This allows us to monitor how the performance of the ETFs and the movement of foreign exchange rates affects the total returns and the volatility of portfolios. Since we began monitoring these portfolios at the beginning of 2012, we have found that the Global ETF portfolios have all vastly outperformed a simple stay-at-home portfolio. As you will see in this post, that gap widened significantly in 2015. In 2015, with the USD and JPY both appreciating a stunning 19% and the EUR appreciating 7% against the CAD, the best global ETF returns for Canadian investors were in Japanese and US equities and USD-denominated government bonds. The worst returns were in commodities and Canadian equities. The chart below shows 2015 returns, including reinvested dividends, for the ETFs tracked in this blog, in both USD terms and CAD terms. 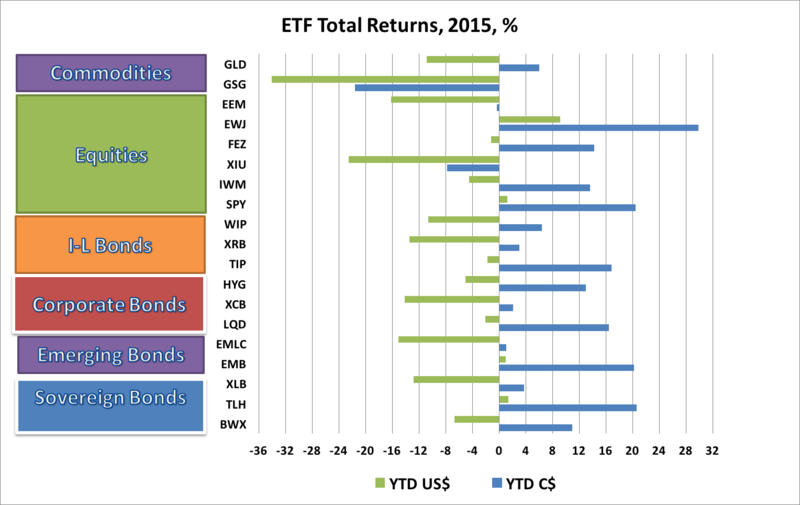 Global ETF returns varied dramatically across the different asset classes in 2015. In USD terms, only 4 of the 19 ETFs we track posted positive returns, while 15 ETFs posted losses for the year. In CAD terms, 16 of 19 ETFs posted gains, while just 3 posted losses. The best gains were in the Japanese equity ETF (JPY) which returned a stunning 29.9% in CAD. The US Long (10-20 yr) Treasury Bond ETF (TLH) was second best, returning 20.6%, followed by the S&P500 ETF (SPY), which returned 20.4% in CAD. Other big gainers included USD-denominated Emerging Market bonds (EMB) 20.2%; US inflation-linked bonds (TIP) 16.9%; US Investment Grade Bonds (LQD) 16.5%; Eurozone equities (FEZ), 14.2%; US small cap stocks (IWM) 13.6%; and US high yield bonds (HYG) 13.0%. Canadian ETFs with positive returns included Canadian Long Bonds (XLB) 3.8% in CAD terms; Canadian real return bonds (XRB) 3.0%; and Canadian corporate bonds (XCB) 2.1%. The worst performer, by far, was the commodity ETF (GSG), which returned -34.1% in USD and -21.6% in CAD. Second worst was the Canadian equity ETF (XIU) which returned -7.8% in CAD terms (including dividends), followed by the emerging market equity ETF (EEM), which returned -0.3% in CAD terms. In 2015, the Global ETF portfolios tracked in this blog posted solid returns in CAD terms when USD currency exposure was left unhedged, but negative returns when USD exposure was hedged. In a November 2014 post we explained why we prefer to leave USD currency exposure unhedged in our ETF portfolios. A simple Canada only 60% equity/40% Bond Portfolio returned -3.0%, as mentioned at the top of this post. Among the global ETF portfolios that we track, the Global 60% Equity/40% Bond ETF Portfolio (including both Canadian and global equity and bond ETFs) returned 9.2% in CAD terms when USD exposure was left unhedged, but -0.3% if the USD exposure was hedged. A less volatile portfolio for cautious investors, the Global 45/25/30, comprised of 45% global equities, 25% government and corporate bonds and 30% cash, gained 8.1% if unhedged, but -1.2% if USD hedged. Risk balanced portfolios outperformed in 2015 if unhedged, but underperformed if hedged. A Global Levered Risk Balanced (RB) Portfolio, which uses leverage to balance the expected risk contribution from the Global Market ETFs, gained a robust 14.1% in CAD terms if USD-unhedged, but had the biggest loss of -4.4% if USD-hedged. An Unlevered Global Risk Balanced (RB) Portfolio, which has less exposure to government bonds, inflation-linked bonds and commodities but more exposure to corporate credit, returned 10.3% if USD-unhedged, but -3.4% if USD-hedged. 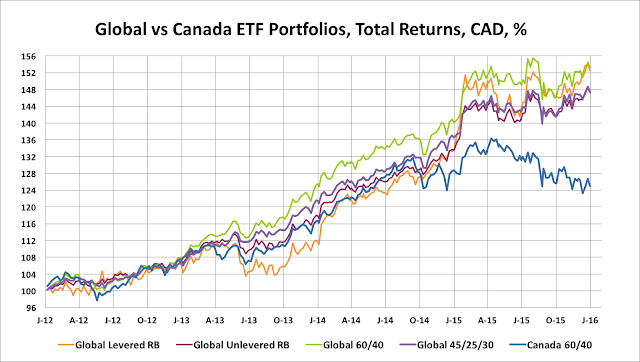 While the returns on our global ETF portfolios greatly outperformed the all Canadian portfolio, we should not pat ourselves on the back too much. It is worth remembering that in USD terms, all of these portfolios had negative returns. Nevertheless, if the objective was capital appreciation in CAD terms and capital preservation in USD terms, these portfolios did the job. In my view, there were three key policy events that left a mark on Canadian portfolio returns in 2015. The first was the Bank of Canada's decision to cut the policy rate in January. The second was the Chinese central bank's decision to devalue to Chinese Yuan in August. The third was the US Fed's decision to hike the US policy rate in December. The impact of each of these three decisions can be seen in the chart below which tracks weekly portfolio returns since the beginning of 2012. The Bank of Canada's decision to cut the policy rate boosted all of the ETF portfolios in January, but the unhedged global ETF portfolios saw a much larger and more sustained jump in returns as major foreign currencies appreciated sharply against the Canadian dollar. The PBoC decision to devalue CNY caused a correction in global equity markets and contributed to the Fed's decision to hold off from hiking rates in September. The Fed pause saw equity markets stabilize somewhat until December when the Fed followed through on its promised rate hike, a move which kept the Canadian dollar under downward pressure. The Global ETF Portfolios posted solid gains in 4Q15, while the Canada only ETF Portfolio added to its losses for the year. As we enter 2016 in a continuing uncertain environment, characterized by significant global divergences in growth and central bank policies, and depressed oil and other commodity prices, remaining well diversified across asset classes, with substantial exposure to USD-denominated assets and with an ample cash position continues to be a prudent strategy.